Jillian Perlaky gives a talk at our first women’s night. We kicked off our monthly Men's & Women's nights! The men held Blindfold Olympics and heard a talk on brotherhood. 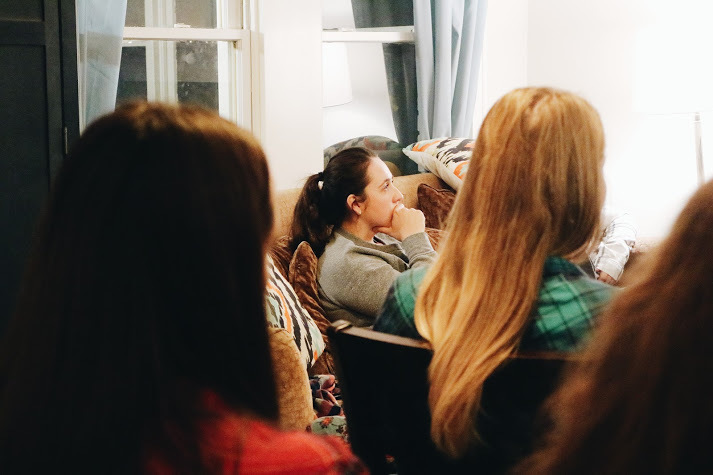 As for our Women's Night, Jillian Perlaky gave a talk about the importance of being authentic and not fearing vulnerability with one another. We wrapped up the night with snacks and pumpkin painting and carving! The goal of these nights is to bring men and women who are already involved in small groups, as well as those who are not, and to give them access to the greater community. As a people, we can hear the Gospel, and look to each other for support and accountability as we strive to grow. Our main avenue of outreach this year will be through small groups! Small groups are lead by both Missionaries and experienced students. Approximately 30 students are consistently involved in all of the groups. The men are going through the SPO Men’s group material. For the women’s bible studies, each week we go over the gospel reading for the upcoming Sunday, discuss the different aspects of the reading, and apply the lessons to our lives. We've been pleasantly surprised by how quickly our groups have become comfortable with one another, and we have been open and ready to share in each others lives! The weekend after Halloween, we held a party! The Halloween party is always thrown so as to provide an option that is still a great event, but doesn’t rely on alcohol or other harmful additions to do so. We invited everyone to come in costume and compete in a contest. We provided plentiful themed snacks, held an apple bobbing contest, played limbo, and danced all night! Students from UMKC, JCCC, and Rockhurst came and met one another, and the party didn’t die until late in the light. As simple as a Halloween party sounds, it’s these fun events that get students to see some authentic joy, to grow comfortable with our community, and open their hearts to deeper relationship. Pray for us and the students, as in November we hold our annual Fan Into Flame retreat!